Pontiac Solstice Forum > Vendors > Diode Dynamics > Pontiac Solstice Turn Signal LEDs! Plug & Play Install! Increased Output! Pontiac Solstice Turn Signal LEDs! Plug & Play Install! Increased Output! From the factory, turn signal bulbs are powered by standard incandescent lights that light up amber in color. Newer luxury vehicles are using LEDs for turn signals, because LEDs offer a crisp, instant on/off, increased brightness, and true, vibrant color. By replacing the bulbs in your Solstice, you can achieve this modern look! 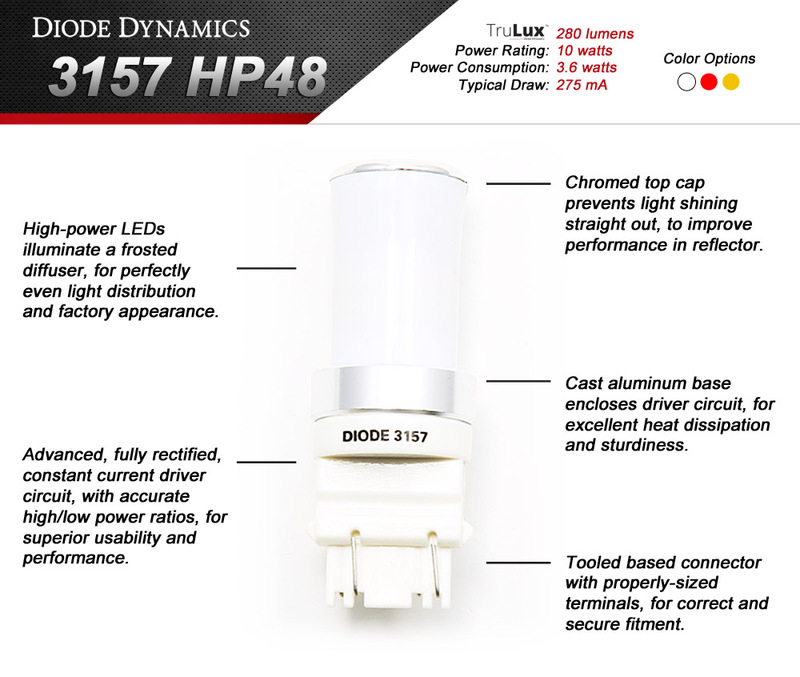 Diode Dynamics carries the brightest, highest-quality bulbs available. These LED bulbs are designed by our engineering team here in St. Louis, and every bulb carries with it a three-year limited warranty. Last edited by Diode Dynamics; 12-21-2017 at 11:00 AM. The front turn signals use a 3757A bulb, which require cutting the tabs off the edges of the 3157 style base. Are there any plans to make a base that fits the 3757 style? I seem to recall the 3757 will fit the 3157 socket without modification, but haven't tried it. Also, are there installation instructions for the resistor kit? 3757 is a cross reference number for 3157, so they will be a direct replacement for the Solstice. As I understand it, the 3157 has small tabs on the edges of the base, which prevent insertion into a 3757 socket, as the 3757 does not have these tabs. The photo shown above shows these tabs, which means they will not fit into a socket for the 3757. A 3757 should, however, fit into a 3157 socket, which is why it shows up as a replacement for a 3157. I recall having to cut the tabs from a 3157 bulb to replace my bulbs. We carry these three major sizes, which fit about 98% of the vehicles on the road today. The tabs on the sides can differ, but our options will fit with minimal modifications. If you have one in stock in Earth City, I can drive over and we can test-fit, just to be sure. If it does fit, I'll go ahead and buy them. Ya know, there are a lot of LED bulbs out there that have the resistor built in to eliminate hyperflash. Why can't you guys do this??? There are a lot of LED bulbs out there that "claim" to have resistors built in and eliminate hyperflash, but it's not possible if you want to have a reliable LED product. Heat is a byproduct of electrical resistance. Heat is also the biggest enemy to LEDs and will cause premature failure. If you were to integrate enough resistance on the base of the LED or the LED itself, you'd definitely shorten the lifespan of the LED or it might fail after just a few turn signal cycles. By adding resistors into the wiring, you are placing that heat away from the LED where it can't create any possibility of damaging the LEDs. We are always improving our products as technology improves, but heat is still the biggest limiting factor for LED bulbs. I wish there was a way to install these without losing the ability to automatically detect a failed bulb. Can't there be an adapter made that could be placed between the bulb socket and the connector that could isolate the resistors from the bulbs, and thus eliminating the need to cut into the wiring? Our engineering team is in the process of developing new solutions for resistor harnesses, but I don't have an ETA available for their release. With our cars, the front and rear turn signals are on the same detecting circuit. That means you only need to install a load resistor at the front to handle LEDs in the front OR rear turns (if you have both w/LEDs you'll need a lower resistance resistor, or two in parallel). You can then install these resistors in the front (short) pigtails between the connector in the front of the engine bay and the fog/turn lamp assembly. Those pigtails are available used from many other GM cars, or even new aftermarket if you ever want to go back to 'stock'. That all means that you don't need to damage the larger wiring harness in the car.